Would you like to see your school go solar? Switching to solar energy can save your district a significant amount of money, reduce its environmental footprint on the community and contribute to students’ science, technology, engineering and mathematics (STEM) education. According to data from Brighter Future: A Study on Solar in U.S. Schools, a report published by the Solar Foundation with support from the Solar Energy Industries Association, there are nearly 4,000 K-12 schools in the United States with active solar systems. That means more than 2.7 million American students attend solar schools. Your school district could be next. It just takes a few advocates willing to start the conversation and then work to build awareness and support. That first advocate could be a student, a parent, a teacher, a board member, or anyone else with a stake in the district’s energy future. Here’s how one California school district, Oakland Unified School District, installed 3.6 megawatts of rooftop and parking lot solar power systems at 16 of their campuses earlier this year. As Jody London, Vice President of the OUSD Board of Education, tells it, the seed was first planted several years ago with a simple conversation at an elementary school parent meeting. A group of parents urged the district’s head of facilities maintenance and construction to consider going solar. He took the idea to heart and others were inspired to join the effort. The district decided to pursue a KyotoUSA Solar America Grant. KyotoUSA is a non-profit organization that provides free services to help public school districts evaluate whether they can go solar. Through the HELiOS Project, industry volunteers helped OUSD develop a Solar Master Plan for its renewable energy project. They performed an analysis of costs, savings and return on investment. This allowed project champions to make the case for going solar to the district’s leadership. Next came convincing the district’s Chief Business Officer that commercial solar panels would be a reasonable investment. They developed several different financing plans until they found the one that got the CBO on board. They decided that owning their panels, rather than leasing them, would be the best way to go. They then took the case to the voters of Oakland for a bond renewal to finance the initiative. Even though Oakland has economic challenges, the voters approved the bond renewal, and a significant amount of it was devoted to renewable energy and the solar schools project. Things were finally underway. SunPower was proud to be selected as OUSD’s solar provider, and in February of 2015, we had the extreme honor of attending the OUSD Solar Dedication Ceremony, where students, parents, teachers, administrators, district leaders, solar engineers and community members celebrated the launch of the first phase of their solar energy system. London emphasizes how many heroes it took to bring the program to fruition. It was worth it. She says the return on the district’s investment is already evident with utilities savings expected to be in the millions. Recently, I met a young man who attended SunPower's annual week-long summer SunPower® Solar Science Academy so he could learn how to help his local school district go solar. Aaron Feigelman, a recent Benicia High School graduate and freshman at the University of California, Los Angeles, studied sustainability leadership in Ecuador during his senior year. 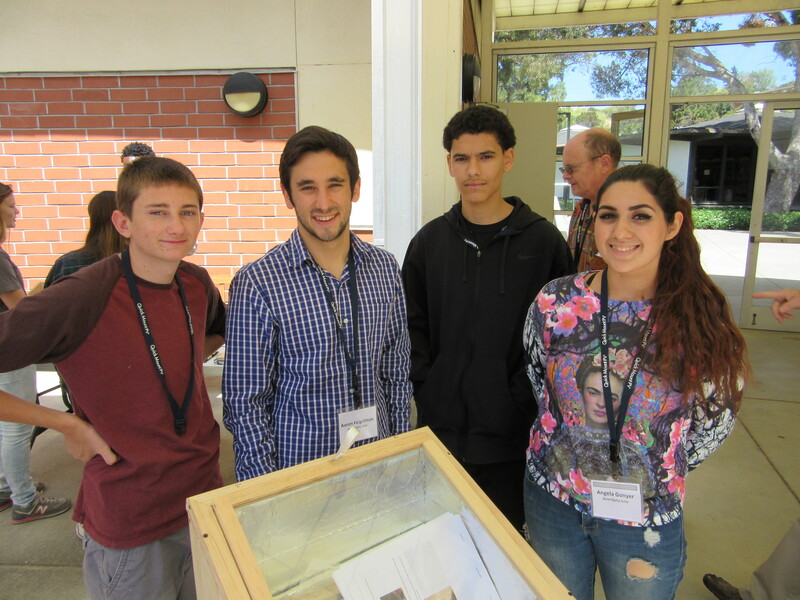 As part of that program, Feigelman (in checkered shirt in photo below) wrote a sustainability leadership plan to help his school district go solar. He says he had no idea where to start, but he lucked upon the story of another student who got a $22 million solar project installed in her school district with the help of the HELiOS Project, the same organization that helped Oakland USD with its Solar Master Plan. With their strong support, he has met with Benicia’s superintendent, school board members, the facility manager, the Sustainability Commission, the Chief Business Officer and others. In about one year, he has accomplished a great deal, and supporters are taking up the cause as Feigelman prepares to leave for college. Be patient and persistent. Be prepared to send a lot of emails, call a lot of people and attend a lot of meetings. Keep persevering, even if you don’t immediately get answers – email again, call again, don’t give up. Get community support. The school board will respond to the community’s enthusiasm, particularly if it’s built on the knowledge that bringing solar to the district will enhance students’ education and job prospects. Know that in the end it’s going to come down to economics. People want to be good stewards of the planet, but they also must be good stewards of the district’s resources and the taxpayers’ money. Make it easier for them to say “yes” by making a solid financial case for going solar. Though every district’s solar journey is likely to be different, and some will go more smoothly than others, these are two inspiring examples of how anyone can help bring solar energy to their own schools and students. To us, solar panels on a school’s rooftops are a symbol of hope for the future and for the promise of the sun, which we at SunPower believe belongs to everyone. Could you be the one to get a solar project off the ground in your district? It just takes one voice to get the conversation started. Mount Diablo Unified School District installs solar at 51 campuses to save $220 million over 30 years. UC Merced achieves campus sustainability goals with solar power. San Ramon Valley Unified School District goes solar to save big.